European pepper moth (EPM), Duponchelia fovealis Zeller is an invasive pest in the US. It was first discovered in San Diego County in 2004 and again in July, 2010. EPM has a CDFA pest rating of C, which means it is currently widespread in California. APHIS, National Plant Board, and industry stakeholders have established an EPM task force to address the pest issue. I have been invited to be a part of the Technical Working Group along with my UCCE colleagues, James Bethke and Steve Tjosvold to work on research and outreach related to this pest. Information on the economic impact of this pest in California or in the US is unknown, but here is some general information about this pest. EPM belongs to the family Crambidae. Crambids are known as grass moths or close-wing moths. Older literature classifies this pest under the family Pyralidae. Some sources also refer to EPM as southern European marshland pyralid. Peppered moth, Biston betularia (Common name: measuringworms, Family: Geometridae, Order: Lepidoptera) from Europe is not related to this species. It can be confusing when the name European peppered moth also appears in some sources, but verifying the scientific name helps confirm the identity. Origin and Distribution: EPM is a pest native to the Mediterranean region and the Canary Islands. It is also reported to be an important greenhouse pest in the Netherlands for the past two decades. It is an established pest in many European countries, the Middle East and Africa. EPM is now reported to be present in several central and southern California counties and in Arizona, Colorado, Oklahoma, Texas, Georgia and Florida. EPM was also reported in a southern Ontario, Canada greenhouse in 2005. 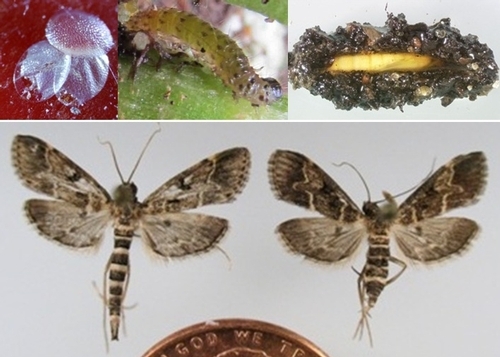 Host range: EPM is a polyphagous pest and has a very wide host range that includes several crop plants like corn, peppers, tomatoes, squash, and strawberries and ornamental plants like azalea, begonia, geranium, and poinsettia. Due to its feeding behavior and preference to infest foliage and plant parts near or below the soil line, crops that have such plant structure may be more vulnerable to this pest. Biology: Eggs are oval, 0.5-0.7 mm long, whitish-green initially and turn bright red as they mature. Females can lay up to 200 eggs either individually or in batches of 3-10 in a roof-tile pattern. Larvae are creamy white to brown with dark spots on their body and have a dark head capsule. They measure up to 20-30 mm when they are fully developed. Pupa is 9-12 mm long, yellowish to light brown initially and turn dark with maturity. A cocoon is spun around the pupa with silk, frass, and soil particles under the foliage, below the soil line or attached to the pots. Adults have brown to grey wings with a wing span of about 20 mm. Adults are good fliers. Males have a long, slender abdomen that is turned upwards. Length of the life cycle depends on temperature, but varies from 6-8 weeks. Egg stage lasts for 4-9 days, larval stage for 3-4 weeks, pupal stage for 1-2 weeks, and adult stage for 1-2 weeks. They produce multiple generations especially in greenhouses (up to 8 to 9) or in warm areas such as California and southeastern US. They can be limited to greenhouses in cooler regions or during cooler seasons of the year and seen in the fields under ideal conditions. Damage: EPM larvae feed on roots, stems, foliage, inflorescences and fruits. They can also feed on the organic matter in the soil. Although they have a preference for feeding at the plant base, damage can be inflicted higher in the plant. Sometimes, larvae emerging from the eggs laid on the top of the foliage can burrow their way down through the stem. Damage ranges from holes in the foliage, wilting, defoliation, girdling of the stem to stem collapse. Damaged areas are also exposed to fungal diseases like Botrytis. 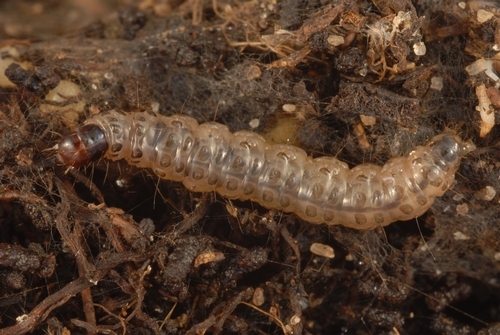 Larvae prefer moist conditions and hide under the foliage that is in contact with soil, just below the soil line or in the tunnels formed by spinning the leaves together. In potted plants where the foliage is not in contact with the soil, larvae can be found in webbing near the edges of the pots. Stem girdling of peppers by larval feeding of the European pepper moth. Photo credit: Bryan Vander Mey, UCCE. Management: Sanitation to remove debris and infestation sites like lower leaves in contact with the soil and use of drier potting medium appear to help reduce the infestation. Biological control with Bacillus thuringiensis, predatory mites (Stratiolaelaps miles, Hypoaspis miles and H. aculeifer), predatory beetle (Dalotia coriaria), parasitoid wasps (Trichogramma evanescens and T. cacoeciae), and entomopathogenic nematodes (Heterorhabditis bacteriophora and Steinernema sp.) are reported to be effective. Chemical control can be difficult with contact insecticides as the larvae hide in protected areas. However, control with acephate, azadirachtin, chlorpyrifos, emamectin, imidacloprid, pyrethrins, and spinosad was found to be effective in areas where they are registered to be used. What to do: If you notice EPM damage on your crop, please contact me at skdara@ucdavis.edu or 805-781-5940. Additional details about EPM and more photos can be found at the below sources. Bethke, J. and B. Vander Mey. 2010. Duponchelia fovealis. Pest Alert, University of California Cooperative Extension, San Diego. Brambila, J. and I. Stocks. 2010. The European pepper moth, Duponchelia fovealis Zeller (Lepidoptera: Crambidae), a Mediterranean pest moth discovered in central Florida. Pest Alert, Florida Department of Agriculture and Consumer Services, Division of Plant Industry. Messelink, G. and W. Van Wensveen. 2003. 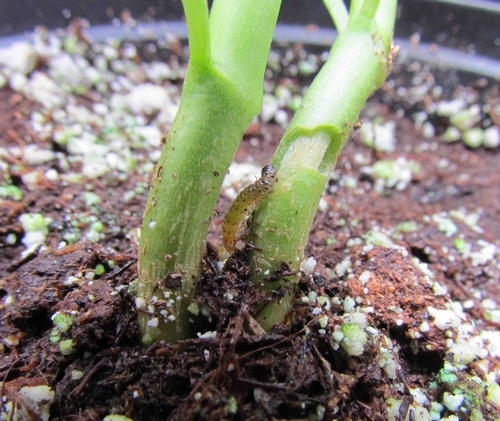 Biocontrol of Duponchelia fovealis (Lepidoptera: Pyralidae) with soil-dwelling predators in potted plants. Comm. Appl. Biol. Sci., Ghent University 68: 159-165.